I told you about the first 3 days of our trip out to Illinois, and I want to tell you what else we did. Thursday morning, we got to sleep in some, and we had planned to spend the day with my sister and her family. I was really looking forward to this time, because I feel like we weren't with them much. My brother-in-law went to work in the morning, and we were planning on picking him up around lunch time. My sister made sandwiches for the kids to eat in the vans on the way to Chicago, and we picked up some sandwiches at Subway. This day, we fueled up before getting into Chicago! We weren't going to pay $4.50/gallon again. When we got into Chicago, we drove under the city in the tunnels. That is such a cool thing to do! I wish I had some great pictures to show you of this adventure, but none of them turned out well enough. Chicago has several tunnels that travel under the city. When we got into a parking ramp, we walked around for awhile to find a bathroom. (Of coarse I really needed to go). Then, our second stop was to Millennium Park. We got to see Chicago's famous stainless steel (very large) Kidney Bean! Chicago is well known for the arts and structures. This is one of many unusual, but very cool pieces of art. It was huge, and fun to look at! This a picture of my sister's kids, our niece, and my kids. My sister's friend let us barrow her stroller while we were out there. It was great to barrow a double stroller! This is our family picture in front of the "Bean!" It was a bit rainy out during this part of the day, a light drizzle. I love the view of the city's buildings in the mirrored-image of the Bean. As you can see, it is super big! I really thought it was cool how the bean had the curved out shape in the inside. This is a view of the Bean looking straight up when standing underneath. It was just cool to look at. My sister said it made her a little nauseous to look at it too long. After the "Bean," we went for a walk through Millennium Park. This is the band shell where they hold outdoor concerts! I would say it was bigger than a football field, and it was huge! There were many speakers over our heads! It was a neat looking place, and I bet it would be fun for a concert. Nathaniel is really growing up! He will be 10 in a few months! This is the big fountain in central Chicago. There is also a big spray that shoots up the middle once in awhile. I have a picture of it, but it didn't turn out so well. It reminds me of 'ol Faithful in Yellowstone. This was one of our favorite parts of the day. This place had two large stone walls that displayed faces of people. The people would change, and the looks on their faces would change from a sober look, to smiling, to smiling with teeth showing. The stone walls also had water spraying off of them, like a waterfall. The kids had fun with their shoes off walking around playing in the water. The more they walked around and played, the more they got wet. This is Caleb, Nathaniel, Terry and Madelyn. This is my sister with her daughter E. and baby D. Her little guy was happy to toddle around in just his diaper. It was cool how the faces on the stones would change with their face expressions, but what was really weird (and cool) was that there was a hole where the mouth was, and every so often, water would shoot out the mouth. The kids thought this was fun! Here is my sister with her little guy. Nathaniel and E. loved getting wet, and walking through the water. I really think that Nathaniel got the most wet! Madelyn and Caleb got tired from the long day. They really had fun though! Terry took this cute picture of Maddie. Caleb had such a great time! Thursday was mine and Terry's 4th Wedding Anniversary! This is a tradition to take a photo of ourselves. Our four years have really flown by! We have done a lot in four years! I will have to share that sometime. The famous Chicago-Style hot dog! The "works" includes: ketchup, mustard, onions, jalapenos and a pickle. We didn't get the jalapenos. It was rather tasty. We had to try one. After the Millennium Park, we went for a drive around the city. We saw a great view of Lake Michigan. I think it looks like an ocean. They had a really long, sandy beach with volleyball nets, and other outdoor activities set up. The buildings in Chicago are big! We saw the Hancock building, drove by the Navy Pier, and saw the Sears Tower. We saw the Water Tower, and then we went to a "yuppy" mall. That is what my sister called it. It was a nice mall located very near the Water Tower. My two nieces loved to go shopping in there. Shopping isn't really my gig anymore, but it was fun to let the little kids run around in a section that was a bit closed off. We ate supper in there in a food court called Food Life. It was a lot of fun in there. The lighting was a little dim, and there were so many great food selections. We each had a card that we brought to which ever location we got food from. The place would prepare our order, and put the charge on the card. Then, we just paid our bill upon leaving. The selections were great! I had a Chinese-type of meal. I filled up my bowl with veggies and the chef added meat and sauces. It was served with rice or noodles. It was very good, and reminded me of a Mongo's Grill. Terry had a HUGE burrito, and the kids ate chicken Alfredo. I wish I could share photos of this part of our trip, but I had forgotten our camera in the van. My sister took pictures, and I am hoping to get copies (someday). The drive home was fun. I love seeing the city lights and action. It was a great day! The time flew! I will share the last two days in another post. This post is a long one already! The trip was so fun! I hope to go again someday! K’NEX Brands, one of the world’s leading construction toy companies, is inviting kids across the country to put on their thinking caps and enter the K’NEXpert Search – an annual contest that invites kids to design an ultra-creative, original model made entirely from K’NEX parts. Three imaginative young builders will each win a $10,000 savings bond for college. WOW! I know that is a grand prize worth winning! What a great way for kids to be rewarded for their imagination and hard work! Ian Culhane is last year's grand prize winner, and he designed an amazing 6,500-Piece Dragon-Themed Roller Coaster, “Belly of the Beast.” He said he thought of this idea while watching the movie Eragon. This year, K’NEX is expanding the contest to include three Grand Prize winners from three age groups: 5 to 6-year-olds; 7 to 8-year-olds; and, 9 to 12-year-olds. Seven additional winners across all age groups will each receive $1,000 savings bonds. Also, all ten winners will receive $500 worth of free K’NEX Building Sets, a trip for three to New York City for the K’NEXpert Award Ceremony, and their very own photo gallery page at http://www.knex.com/. All semi-finalists and finalists will receive discounts on online purchases for a year, K’NEX gear, a K’NEX birthday gift, , and an invitation to visit the K’NEX headquarters and discover, through company designers, how K’NEX is made. The 2009 K’NEXpert Search will run from now through September 30, 2008 with winners announced on or about October 28, 2008. Children enter by printing out the entry form from the K’NEX web site (http://www.knex.com/) beginning July 8, 2008 and mailing it in to K’NEX. Submissions must include a photo of the creation and a one-minute video or one-page summary describing how the child came up with the idea, how long the design took to build and how many K’NEX pieces were used. 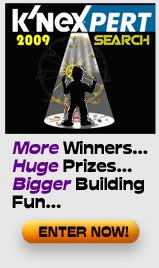 Young builders between the ages of 5-12 must submit an entry within one of four building categories: Ultimate K’NEX Model – built with K’NEX Bricks, Classic K’NEX and Micro K’NEX; Futuristic; Vehicles; and Amusement Park Thrill Rides. Kids are encouraged to let their imaginations run wild – models are judged on creativity, uniqueness and detail. Founded in 1992, K’NEX Brands, the world’s most innovative construction toy company, was established to make and sell what has become one of the world’s leading integrated construction systems for children. Winner of over 200 international awards and recognitions, K’NEX seeks to build young minds with its exciting product line and critically acclaimed K’NEX Education program. For more information, please visit www.knex.com. Kids gone for the weekend. Last night, we met up with my MIL to pick up our dog, who she has so graciously dog sat since before our trip. I think Lena missed us. My MIL was also picking up Caleb and Madelyn for the weekend, too. I just think my MIL is so wonderful! She loves our kids so much, and she is great with them! Thank you, Cheryl! The kids love Grandma, too! It is great that they will get some great one on one time with her and Great Grandma this weekend. Friday night, we met at a Chinese restaurant. It is in the city near where my parents live. The city is huge, and has a monstrosity of restaurant to chose from. So, my point is, while we were there...my parents and oldest brother show up there to eat! How crazy is that? It was great to see them and visit with them, too. Friday night, Terry and I had a great time just being together. It is nice to have the house to ourselves sometimes. It is much more quiet, but it is nice to just have time to rejuvenate. Today, Terry worked and I slept in. :) It was nice to sleep in and get up when I wanted to. Then, I called up my friend, Lisa, and we spent the day shopping and hanging out. It was fun to spend time with her without kids. Tonight, Terry and I went out to eat, and then we went to a movie. It was such a fun night. I am tired now, so I should get myself off to bed. Tomorrow, we will be off to my friend, Nicole's Birthday celebration. I am looking forward to that. We will also get Caleb and Maddie back tomorrow night. Monday, we will pick up Nathaniel in the evening. Kids Lunch Box Cards: A Review and Giveaway! something fun to read while at school. KidsFunCards are great cards that can be put in a lunch box, backpack, book, or any other creative spot your child can get it. I think they are a great way for you to surprise your child with a gift. 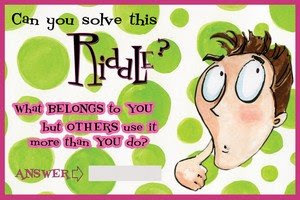 These cards are a variety of information, either gross or funny, mind boggling, or a fun riddle to solve. I think the illustrations are creatively drawn. At only $4.95 a pack of 5 (one for each day of the week), I think it is an affordable way for your child to have some great, and harmless fun! They are even endorsed by Disney! I like that the cards offer a space on the back for a special note from mom or dad. KidsFunCards was created from two moms, Gina and Rose. Gina is the illustrator, and Rose is the graphic designer. Also joining them are Paul DeDomenico (Gina's Dad), Markus Flanagan (Gina's Husband), and Gina's brother, Paul P. DeDomenico. They all make a great team, and created a fabulous business! I think these cards are great for kids! I know Nathaniel will dig them! I can't wait to stick one in his bag on the first day of school next week. Would you like to win a 5-pack of her five cards (25 days’ worth of cards)!!?? **UPDATED**KidsFunCards has offered to sponsor a giveaway to one of my readers! This contest is open to all readers living in the Continental United States. Head on over to the KidsFunCards website, and pick out the set of cards you like the best. Come back and comment on which one you like. Click here to see how you can earn extra credits to win. Contest will end on September 9th, at 7:00 PM CST. Having a girl is so much fun! I love finding cute hair products to put in Madelyn's hair! I was really impressed with the clips that I got from Madison's Room! The quality and designs are so great! Not only are there cute hair clips found at Madison's Room, but headbands and caps! 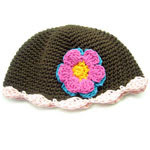 I would love to get one of these cute caps for Maddie! I love that Madison's Room was created from a Mom's heart! Cynthia is the proud mom of Madilyn and Allison, and she combined their names to name her business. She is so thankful to God for her daughters. I think it is great to promote stores that are mom businesses! This is her business, and her girls are her inspiration to each unique design. 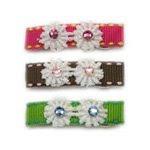 She offers 4 different styles of clips: Snap clip, Big French, Petite pair, Gator clips, and Gator novelty. 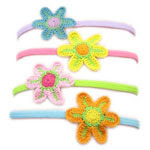 She makes baby headbands, and headbands for older children. Her caps look adorable, and I like that the flower on the hat is removable for either a hair clip, or to change it with a different flower. All her products are handmade. I think that Cynthia does a beautiful job with her hair products, and her time and efforts show in her work. Madison's Room has graciously offered to give my readers a special code for free shipping on all orders over $25.00! Just use the code, "Madison." I recommend you check it out! Thank you to my sweet blog friend, Alicia, for giving me this award! Her and I have met through our blogging, and I am so glad we did! I only wish she lived closer! She is pregnant right now, and it is so fun chatting with her about all her first experiences. This is her first baby, and it is so exciting for them! I am so happy for her and her hubby! Thanks, Alicia! Here are the rules for this award:- Only 5 people are allowed to receive this award.- 4 of them followers of your blog.- One has to be new to your blog and live in another part of the World! So this is who I would like to pass the award on to! 4. Tag 6 bloggers by linking to them on your post. Then commenting to let them know "there it!" 1) I cannot go to bed at night, without getting the dishes in the dishwasher. I hate waking up to a counter full of mess! Along the line of dishwasher, I really rinse them off well before loading, because I am afraid they won't totally clean! (like spaghetti sauce!) I know I don't always get the dishes done every night, but it is a pet peeve of mine if they sit there all night. 2) I can't stand drivers who are rude on the road. Those drivers who don't merge over for oncoming cars, those drivers who speed ahead and sneak in at the head of the line, the ones who don't let cars in when there is a traffic jam (these are mostly women drivers)...and those that drive slow in the fast lane! Mostly, I am a patient person, but when it comes to driving, my patience is limited. 3) I don't mind doing laundry, but I hate to put it away. This one, I agree with Leah on! I really don't care to fold it either, because the kids like to "help" by being unhelpful~ you know what I mean. I know that this drives my hubby wild, but at least I get it washed! Really, it isn't my best quality. ~lol. 4) I love having my coffee in the morning. If I miss it, I feel like my day is all off somewhat. 5) I cannot go to bed at night without brushing my teeth or washing my face. I know that some people get too tired to do this, but I will not be too tired to do it! 6) I like to have all my towels and washclothes folded a certain way, and placed on the shelf or in the drawer a certain way. Not all of my life is this organized, but I do get silly about how somethings should be done. (hey, I used to color coordinate my clothes in my closet) I think that is correctly identified as a Type A personality. 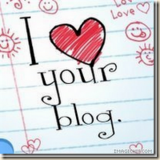 *Fun to meet new people all the time with blogging! Thanks, Leah! This was fun!! Tonight, Nathaniel had his Open House for his 4th grade year. He is so excited about getting back into school. On the way to the Open House he said, "It is going to be so great walking the halls of ****** again!" I am glad he enjoys school, and loves to learn. His teacher seems nice. I am not sure what any of the teachers are like. I did homeschooling for 3 years, and this is his second year in the school district. I don't know too many parents of the school kids, so I am not sure of the "inside" news. His classroom is upstairs this year, so that is a change for him. He said it was the art room last year. I know that the school is a little cramped, need more teachers, and more space. I asked his new teacher how many are in his class. She said there was 30 kids! I really struggle with wanting to take him out to give him more one on one teaching, but I know he thrives so well in the school setting. His Dad came with to the Open House. I am glad that his Dad makes the efforts, but these events are always a little weird. I guess awkward would be a better way to describe it. It went well, though. It is good that he drives the 2 1/2 hours to come to Open House and conferences. Nathaniel played with his friend today. He found out that his friend is moving to Colorado in 4-6 weeks. He is sad about this and he is bummed he won't be here anymore. I have to admit, I am not entirely upset about it. This is the friend of his that I blogged about awhile back that was rude to my kids when he was at our house for a visit. I am not so sure his influence is what I desire for Nathaniel. I feel bad that Nathaniel is sad, but I am a bit relieved. So, now Nathaniel is with his Dad for the weekend, and he starts up with school on Tuesday morning. I have to get in some last minute school shopping this weekend, and make sure he is set. Tuesday night, we went out on a pontoon ride. It was great to get out and enjoy our lake. It is getting a little chillier in the evening, but we have to take advantage of ever moment we have before winter. So, we were out trolling slowly along the shoreline, when a goose decided to fly over to us and land in the water right in front of the pontoon! I kid you not, it was so strange! I was driving at the time, so I was freaking out a bit, because I did NOT want to run the goose over. So, Terry directed me in the direction to back up and go around the goose. The bird stayed along the side of the boat, then it trailed behind a bit. Soon, the bird honked it's horn and flew up to land beside the pontoon again! It was so incredibly weird, and amazing all at the same time. I have never seen a goose act like that. This happened a few more times, then we went faster to the middle of the lake where we played "sea gull bowling." OK, it really isn't as bad as it sounds. We have a gazillion sea gulls on our lake this time of year, and they take up a good section of the lake. So, we started the tradition of driving fast toward them and they all take off. It really does look cool to see all those birds taking off from the water. I know it sounds a bit mean, considering they all probably get the snot scared out of them, but it is good humor to us. So, last night, our friends were over (and it was great to see them, by the way) and we went out on a ride. We had told them about our little goose friend. We were hoping the goose would come out again. So, we were driving near the site where he came out the previous night. We saw a goose sitting on the shoreline, but it didn't respond to us. We figured that it maybe wasn't the same one. The kids were a bit bummed, and we kept on with our ride. About 5-10 minutes later, we hear the "honk," and sure enough our little honkin' stalker was back. Nathaniel brought some bread with and fed him, so I think that made him happy. He did stick with us for quite awhile. I still laugh at the whole thing. It is pretty strange, and we really don't know what to make of it. Maybe he is an orphan? Maybe he gets a lot of snacks from boaters, or is he a pet? I love being pregnant, and enjoying all the changes our bodies go through, and feeling that baby moving and growing inside of me. Even in my fourth pregnancy, I experience new things, because all pregnancy's are different! I am so thankful that I got the book, "The Joy of Pregnancy" to review. This book is loaded with great information, funny stories, joys, pains, and concerns mom's go through with pregnancy. It isn't a "medical book" per say, but it is filled with information, topics, and answers that pregnant mommas can use. There are some great medical topics covered in **Tori Kropp's book, "The Joy of Pregnancy," but as with any books, friends, family, or Internet, women should always discuss concerns/issues with their doctors. While reading the book, I like that each chapter explains what's happening to my body, as well as my baby's body. So much happens in pregnancy, and there are so many questions. I love that the Joy of Pregnancy covers the topics so well! The book covers the increased hormone levels in our bodies, and the baby's size and development each month. I just get overwhelmed with being pregnant knowing what the baby and I go through. I think the author does a great job explaining what is normal weight gain with pregnancy, but that it can vary with every woman. She also writes about which medications are safe to take, and what the different stages of bed rest that can be ordered. There are so many things that mom's need to do to prepare for their baby's arrival (like registering at your hospital, what to pack for our stay while in the hospital, how to choose a pediatrician, etc.) and what type of items you can get for after the baby is here. I think that **Tori Kropp did a great job informing pregnant moms about what to expect, what to do to prepare, what is "normal" and how to get ready for our little baby. **Tori has many years of experience working with pregnant women, so I think she is a pillar of information and experience. I recommend this book to all women in their first pregnancy all the way to their last pregnancy. I think this book would make a great gift to a new momma, too! Tori Kropp, R.N. is a perinatal nurse who has delivered thousands of babies at the prestigious California Pacific Medical Center in San Francisco. She is the founder of Stork Site®, a community website for expectant and new parents, which she will relaunch in January 2008 at http://www.storksite.net/. Known as "the Dear Abby of pregnancy," Kropp has been interviewed on national television and radio and in national print publications, including CNN, The Wall Street Journal, New York Post, Washington Times, Atlanta Journal Constitution and Chicago Sun-Times. She lives in Marin County, California, with her family. You can get her book, The Joy of Pregnancy at Amazon right now for $11.96 on sale! Just click this link! I got an award, thanks! 3. Nominate up to 7 other blogs. Alicia, Sarah, Lisa, Jeannie, LeAnn, and Miss Daisy....You gals rock! My baby is a celebrity! I am 20 weeks today, but my ultrasound measured me at 20 weeks and 4 days. I would be alright if the baby came even earlier, and we could get him or her in this year yet. (Good tax deduction) :) Hey, I can dream, can't I? I just want our little baby to be gorgeous, smart, wise... healthy, and born without any complications. I am so excited for this baby, and the expansion of our family. We don't know if our baby is a girl or boy yet, because my husband loves the surprise factor. I would rather know, just for the fact of getting those baby clothes ready, but I am banned from preparations I am OK with waiting. Nathaniel thinks that the baby is a girl, but Terry, Caleb and I think that the baby is a boy. I think I may have seen a little peter in there, but it is so hard to really see anything. It could have just been part of the umbilical cord...who knows! We are half way to knowing who will take the fourth child place. I have my Doctor's appointment tomorrow afternoon to go over the ultrasound reports to know all the stats, and to get the run down. I am excited to hear what he has to say. Beddy-Bye Baby Game: Review and Giveaway! 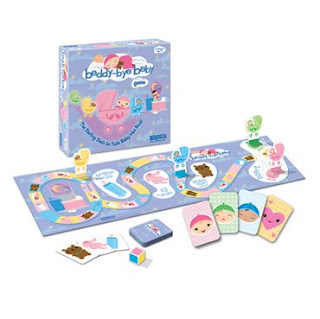 The ultimate toddler/pre-schooler game is from Briarpatch called Beddy-Bye Baby! There is no reading required! It is great! The cards have nice big pictures on it, and they have fun colors, too. The game includes the game board, 48 playing cards, 4 tokens with stands, and 1 rattle die. I think that this game does cater to the female crowd (in my opinion), but my son loves it, too...and he is 3 years old. He likes to tuck the baby in bed with it's teddy bear, bottle and p.j.'s. He collects these items needed for baby's bedtime along the path on the game board. He loves that he can try to be the first one to accomplish the tasks, too. I think this is a great game to help kids see what needs to be done to get ready for bed. Each game piece is a baby in a buggy on a stand. There are four pastel colors to chose your baby: pink, green, yellow and blue. The game has a retail value of $19.99, and is suited for ages 4+. Would you like to win this adorable Beddy-Bye game for your kids, or someone you know? Briarpatch has offered to give one of my readers this fun game! I know with my last review of the Briarpatch game, Clothespins! Some of my readers said they would love to own Beddy-Bye Baby~ Well, now here is your chance to win! This contest is open to all readers living in the Continental United States. Just go to the Briarpatch website and look at all the great games on their site. Come back and comment on another game you would like to have in your home. Click here to see how you can earn extra credits to win. Contest will end on September 9th, at 7:00 PM CST. Don't you want to just cry when your baby or toddler suffers from diaper rash? Sometimes I do cry right along with them. I hate when I add to their pain with wiping their tush when it is soar. I have had a hard time finding something that actually works for their little bum! It seems that some creams or ointments just irritate their little bottom more. I know next time I have Maddie or Caleb in for a check up, I will be sure to ask about the new ointment called Vusion. Here is the company statements: *Vusion was specifically formulated for the treatment of diaper dermatitis complicated by documented candidiasis (DDCC) in infants 4 weeks and older. This inflammatory condition occurs when diaper dermatitis, also known as diaper rash, is complicated with a fungal infection caused by yeast known as Candida. The existence of Candida is readily is readily determined by microscopic evaluation for presence of pseudohyphae or budding yeast. Vusion was approved by the FDA in February 2006 and is the only prescription product approved for the treatment of this condition in the United States. * I am hoping that this prescription ointment will bring some relief to my baby's bottom. Noodleboro Learning game: Review and chance to win! Wouldn't it be great if you could teach your child an important life skill while playing a really fun game? Noodleboro's Pizza Palace game does just that! 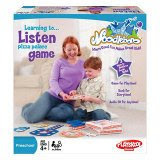 You can teach your child the importance of listening while making pizzas! Making pizza's at the Pizza Palace, kids have to listen carefully to get the order correct. The order giver(usually Mom or Dad) tells the pizza-maker (your child) what they would like on their pizza. Kids really need to listen and watch, so they can get the order just right. They need to remember the order, in order, too. Then, the game becomes like a memory game, because you flip over the topping cards so the pizza maker can't see what the toppings are. It is fun to make the game a bit of a challenge if the order giver changes their order once in awhile. The game has 2 pizza boxes, 2 card board pizzas with outer rings, 1 Chef's Hat game board, and Pizza topping cards. To make this game fun for younger learners, you can work as a team to build the ultimate pizza! Or, you can make and deliver a made pizza within a certain time frame. I think this game is a lot of fun, and I love that it promotes our children to really listen carefully! Our home loves games, and I love teaching my children new games. 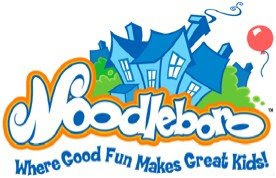 Noodleboro offers other great games for learning to share or using manners. This game is suited for ages 4 and up. 2-3 players can play this game at a time. My kids love it! MomCentral is raffling 200 Noodleboro games to Mom's in a contest! Would you like to have a chance to win? Just click this link. Then sign up to win! It was great to be away from home, and traveling out to Illinois for the week. I will say, it is good to be home, though. It is funny how when you are on vacation, home sounds so great at the end of a vacation. For the trip in the car, I was actually surprised at how well the kids did. 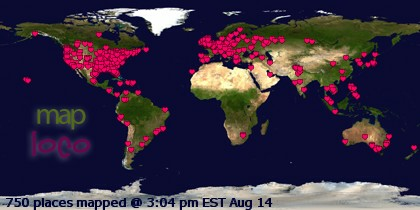 We saw some fun sites, and missed the morning traffic jams on our first day of travel. My niece came with us, and it was fun to have her traveling with us, too. It was great to see my sister and her family. She was so gracious to let us stay at their house for the week. Her daughters let Terry and I sleep in their bed, Maddie was in the pack-n-play in our room, Nathaniel slept down in the basement, and Caleb was going to sleep on a mattress on the floor in the boy's room. The first night, Caleb woke up crying at about 2 in the morning. My brother-in-law went in the room and brought him to us. (I wasn't awake for any of this) Caleb woke up sad and frightened. He didn't know where he was, or where we were. So, we ended up putting the mattress on the floor in our room. We were all snug in the room for the week, but it all went well. We left at 6:00 A.M Monday morning. We made 2 stops for food. Breakfast was at Perkins (YUM) and Lunch was at a Truck Stop. We only made one other stop, and that was to get gas in a city just about 15 minutes from our house. We got to my sister's house at about 5:00. It seemed like the drive went quickly, and the kids were amazingly happy. We really didn't have any major issues or crying spells. I will say I am happy that we have a portable DVD player. We did watch a couple movies on the way out there, and a couple on the way home. Monday night we just hung out at their house and chit chatted. The kids had a fun time connecting and playing together. Suppertime! Caleb, and his two cousins. The one in the hat (Z.) is 6 years old, and his younger brother (E.) will be 3 in September. Caleb and E. are only 3 1/2 months difference in age. Here is some of the clan! My sister's daughter, E. is the one in the white shirt, and she is 5. E. and Maddie. E. was excited to have Maddie come. She loved playing with her. E. is a very girly girl, and so is Maddie, so they got along great. When the kids were out playing in the back yard, a bird decided to nail Nathaniel with his deadly weapon. I am sure that the bird knew Nathaniel was a hunter (or he does with his Dad) so, the bird fought back. ~LOL He did have his camouflage hat on. I thought it was pretty funny. Nathaniel wasn't impressed, to say the least. Tuesday, we slept in a little bit~ like 7:00 A.M. ~ and just hung out in the morning. We decided to go out to eat for lunch. We went to Applebee's. Then, we drove to Aurora to the train yards to watch trains. Caleb and I took a cat nap. Then, we went to a park to play for awhile. It was fun to just spend some time together as a family. Next we went to look for a swim suit for Terry. Can you believe that Walmart in Illinois does NOT carry swim suits in August? That is crazy! I think they should sell them year round! People travel in the winter, go to the gym/hotel, or other things. That was silly. In the evening, we just visited with my sister and her family. I didn't feel well that evening, so I am glad things were low key. Wednesday, we drove to Chicago and went to the Shedd's World Aquarium. I love this place! I went there when I was in High School, and I loved it then! We saw so many great looking fish, and other aquatic animals. We saw the dolphin show, but I will say I think it wasn't as great as I remember it to be. All the Dolphins got up on the edge and posed for us. We ate lunch at the Shedd's restaurant: Soundings. We had a great view of the city of Chicago from up there. The prices of the meals were spendy there, but we didn't have cash on hand to buy from the vendor's outside of Shedd's. The Dolphins were really fun to watch! We were amazed at how fast they swim! I read on the Shedd's website that the Oceanarium will be in construction for 9 months starting in September and be closed. So, I am really thankful that we went when we did! This crab was crazy looking. He even had the Ocean animal life growing on him, as well as it was growing on the rocks in the tank. I am not sure what it was. It was fun to watch him, though. These are some Sea Horses. What amazing creatures! We also watched a Dive Show, where a diver went in with a pool of fish and talked about what they did, liked, how they responded to things in the ocean, etc. It was a great experience, and fun to learn more. The kids all liked our day there, but they were tired when we were done. When we left, we were walking on the sidewalks. We noticed two squirrels chasing each other, and it was so comical. Then, the one squirrel took off, and one was left behind. So, we decided to feed something to the squirrel. He got pretty close to Nathaniel, and I think he would have got a little closer, but Caleb made some sounds and got out of the stroller. A seagull joined in on the snack time, and I think they wanted to have a fight over the cereal. It was a fun time, and we enjoyed the interaction. Next, we stopped at the Children's Garden, located near the Shedd's Aquarium. The kids had a great time playing in here. It was a "yuppie park" as Terry called it. I thought it was interesting and fun. The floor under the jungle gym was squishy, like a soft foam. There were some planets, spherical shapes, that the kids played with or on, too. Maddie really liked playing with the rocks. After the park time, we decided to head back. We did a little sight seeing, then got back on the road for my sister's house. We noticed we needed gas, so we pulled into a gas station. $4.47 a gallon in Chicago!!! Isn't that terrible? We only got 4 gallons to get us back. That was a ridiculous amount to pay for gas! My sister said Chicago is the most expensive for gas anywhere in the state. I believe it! We had a late supper Tuesday night...it was about 8:00. The kids were very tired from a long day. I am submitting my vacations in the carnival at We Are THAT family! Join the fun! Baby Bunch: A great gift idea! Babble Soft: making life for parents easier! Pregnancy hormones at it's best! Last night~ and Caleb is funny!